The very first Russian car was produced at Yakovlev-Freeze plant, which had been founded in 1891 and produced internal combustion engines. For some time, cars of the make Mercedes were produced with Russian-built bodyworks! Nowadays, the popularity of Russian cars has made a drop. Nevertheless, in accordance with new cars sales statistics, some cars of Russian origin remain the most popular in sales. The new Joint Stock Company was founded on base of the Moscow Plant ZIL, named after Likhachev I.A. At present, the enterprise manufactures and sells energy sources and leases its premises. In the beginning of 2014, 2,305 persons belonged to the society. The ZIL emblem is presented in form of a stylized inscription consisting of its name. The company existed without an emblem from 1916 to 1944. The constructor Sukhorukov offered the logo for the car ZIL-114 for the first time. Later, that logo became the company emblem. Albert Rakhmanov, an engineer of the car factory UAZ, managed to produce a real bestseller of an industrial design – UAZ-469. His logo sketch, where the bird matched with a circle was depicted, became the make emblem in 1962. In 1981, the logo was changed – it acquired look of a seagull with curved wings matched with a pentagon. The green emblem with the name UAZ below is the last variant of the company logo. The Kama car factory was founded in 1976. 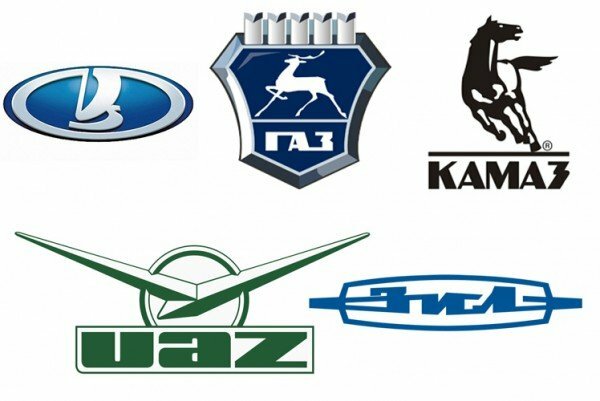 There is a patent for two forms of the word writing: “КАМАЗ” and “KAMAZ”. The make ranks ninth in the world in production of trucks. The plant also produces tractors, combines, buses, and other units. KAMAZ was the winner at the rally “Paris-Dakar” 12 times. The KAMAZ emblem, on which the horse running at full tilt with its mane carried by the wind is depicted, is widely known in Russia, as well as abroad. The Gorky car factory (GAZ) is known for its production of trucks and minibusses. The cars of the make GAZ were originally created as copies of cars of the American make, Ford. Both companies had similar emblems. The letter “Г” of GAZ emblem and the oval, where the name is written, were almost the same as elements of Ford emblem. The personal GAZ emblem, on which a deer is depicted, appeared only in 1950. The coat of arms of Nizhny Novgorod, where the plant GAZ is located, became the basis for the logo. LADA is the make belonging to AvtoVAZ OJSC, the largest Russian car manufacturer. Its logo in the shape of an oval with a rowboat existed since 1994. The new emblem has the rowboat under a sail, which is made in graphical letters; the white and blue colors of the make remained unchanged. The update of the logo was entrusted to the chief designer of AvtoVAZ, Steve Mattin, who had headed the design of the company Volvo. The logo with a floating rowboat describes the location of the VAZ plant (Samara region, on the Volga river). In ancient times, merchants’ rowboats were the only transport by which goods were transported by the river Volga. The rowboat is depicted in form of the initial letter “V” entering into the name VAZ.